Summary : This is the story of a tea that truly smells of chocolate. And which, once brewed, looks amazingly like a orange tea. Yet, at the end of the day, this tea from Culinary Teas is a tea that somehow tastes like neither. Indeed, it's just a typical black tea that, for whatever reason, tastes like neither of the flavored ingredients added. Review : Chocolate is like the greatest substance on the earth, well, almost. I mean, who doesn't, in their deepest desires, in their darkest hours, really enjoy chocolate? Chocolate candy bars, chocolate candy, and....above all...chocolate tea. And so it was with jittery anticipation that I looked very much forward to giving the Chocolate Orange Tea from Culinary Teas a try. I must confess, I REALLY had high hopes for this tea, and not just because of the name. The reason? Simple - I could smell this tea BEFORE I even opened up the space age package that Culinary Teas bundles their teas in. And that smell was of chocolate. So, yum, yum...I opened up the tea bag and was greeted with a real powerful aroma of chocolate. 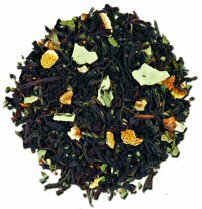 The Chocolate Orange Tea from Culinary Teas is a flavored black tea. What that means is that it is, at its core, a black tea that has then been infused with other ingredients to give it a non-traditional black tea taste. As such, you'll find the following ingredients in this tea : black tea leaves and a house blend of their Grand Marnier Orange and their special Chocolate Tea with cocoa bean pieces, along with other natural flavors. So...as you can see, I don't really know what the hell they put into this tea. Yet, make no mistake, the tea smells strongly of chocolate. Which of course, is why I was so bitterly disappointed that this tea tasted like a unflavored black tea. Chocolate taste? NO. Orange taste? NO. Instead, it just tasted like a black tea, period. Like any other black tea you can find. With my spirits crashed, I got desperate and decided to try the "milk trick", adding in some milk to see if it brought out the taste of chocolate or orange at all. But alas, it was not to be. No matter how much milk I added to this brew, the tea, rather amazingly, still tasted the same! This probably speaks volumes about the quality of the black tea leaves that are found in this concoction - as the black tea flavor is wickedly strong (thus showing high quality tea leaves are used). Yet...I didn't want a black tea taste. I wanted a CHOCOLATE and ORANGE tea taste. And that overpowering black tea taste just covered up whatever chocolate or orange taste this tea may have had. Recommendation : If you like traditional black tea, you'll like this tea. If you want a chocolate or orange taste, well, forget it. You won't find it here. And sadly, adding milk to this tea does nothing either except turn the brew a milky white. Brewing Instructions : Use 1 tbsp of loose leaf tea for each 1 cup (6 ounce) serving. Heat water to 212 degrees (boiling). Pour boiling water over the tea and let brew for 3 - 5 minutes (I let it brew for 4 minutes). Slightly longer brewing times will make the tea slightly stronger and did not impart a bitter taste.